One of the most compact and light-weight valves available. Used for a wide range of applications, the choice of seat, lining and disc options has increased significantly over recent years making the valve a popular choice. A wide range of materials, sizes and pressure ratings gives reliable positive isolation and moderate flow control capability over a wide range of applications throughout the industry. The metal seated valve is well established in petrochemical and oil industries being lightweight, firesafe and suitable for actuation. Butterfly valves offer a number of advantages when used for the proper application. They may be used in a wide variety of chemical services, they are available with small dimensions allowing for use in areas where space is limited, and they allow a high coefficient of flow. Butterfly valves are quick opening valves that consist of a metal circular disc or vane with its pivot axes at right angles to the direction of flow in the pipe, which when rotated on a shaft, seals against seats in the valve body. They are normally used as throttling valves to control flow. Unlike ball valves, butterfly valves do not have any pockets in which fluids may become trapped when the valve is closed. 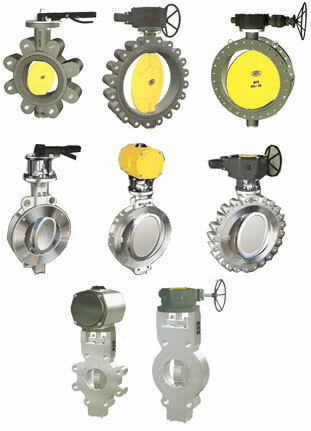 Please click on the links below, to know more about each of the butterfly valves .